Friends, on March 20, 2019 we will partner with Comal Heritage Food Incubator for Comal's March Impact Dinner. Support both organizations while also enjoying fabulous international cuisine in an intimate gathering. We look forward to sharing a meal with you! Read on for more information and ticket details. 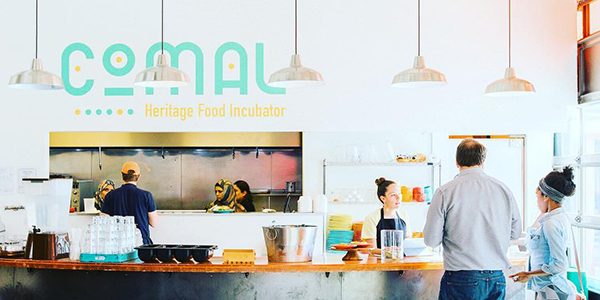 Comal's March 2019 Impact Dinner takes a totally new approach to the beloved monthly series, bringing together an all-star lineup of the culinary incubator's most talented chefs. Under the guidance of Executive Chef Tim Bender, each chef will have one course to highlight her own heritage cuisine, resulting in an internationally inspired menu demonstrating the rich flavors and techniques found in Mexican, Syrian and Ethiopian foods. Early Bird tickets are now on-sale through Sunday, March 10th at 11:30pm for $60 per person, all inclusive. The full menu will be announced on Monday, March 11th. Additionally, six elevated Chef’s Counter tickets are available for $125 per person, providing VIP guests with additional exclusive beverages and delicacies, while sitting up-close-and-personal with all of the action in the kitchen. Focus Points Family Resource Center (the nonprofit parent behind Comal), Friends and Family (a nonprofit organization comprised of, and designed to serve, Colorado's hospitality industry employees), and A Little Something have partnered to host this special event. Proceeds will benefit Focus Points and A Little Something. A Little Something is dedicated to fostering empowerment, psycho-social support, and community to refugee women living in the Denver metro area. 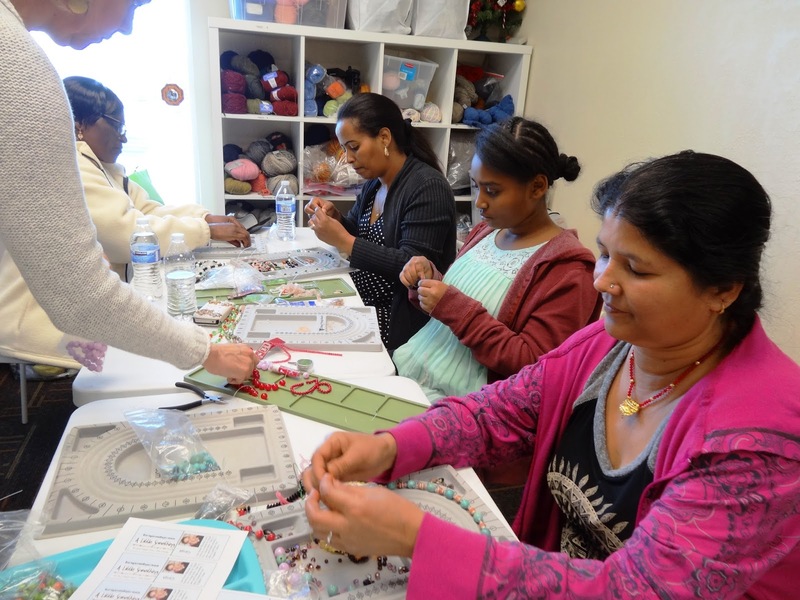 By crafting and selling handmade goods, participants in the program learn new skills while also recovering self-esteem and finding creative expression as they work through the challenges of resettlement. For many of the women, the money they earn through this social enterprise is the first income of their own they've ever had, which, along with financial literacy, is often a first-step to empowerment and self-sufficiency. 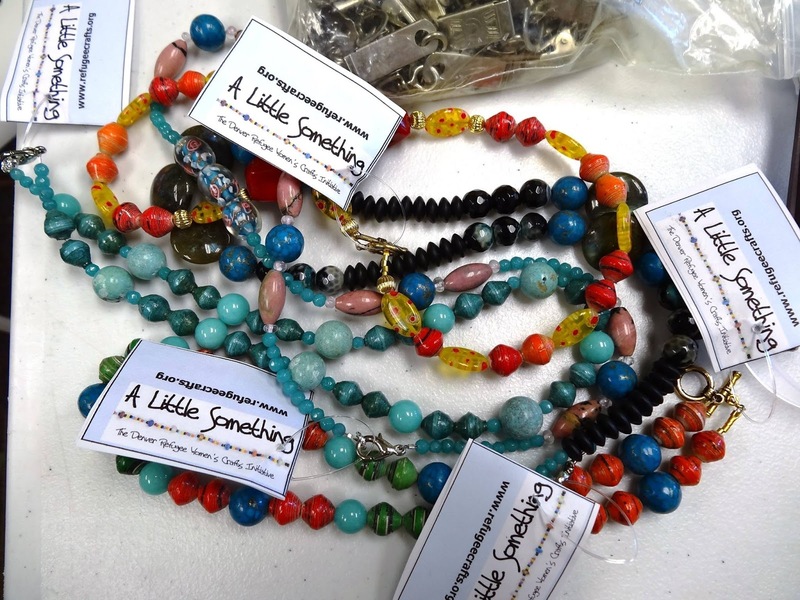 The A Little Something studio is a safe space for sharing, healing, and collaboration for refugee women who are processing their next steps in a new life. 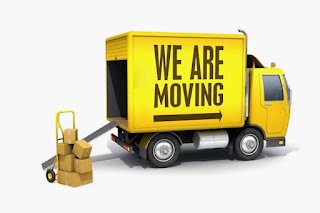 We'll be moving to a new (temporary) space at the end of March 2019. If you'd like to help us with that monumental task, please contact our volunteer coordinator at mariana4volunteers@gmail.com to sign up. We expect to get started at 9:00 a.m. on Saturday, March 23, but we'll need to start packing the week before that on Saturday, March 16 and Wednesday, March 20. The studio is located near Havana and E. Colfax in Aurora, Colorado. Our destination will be close by. 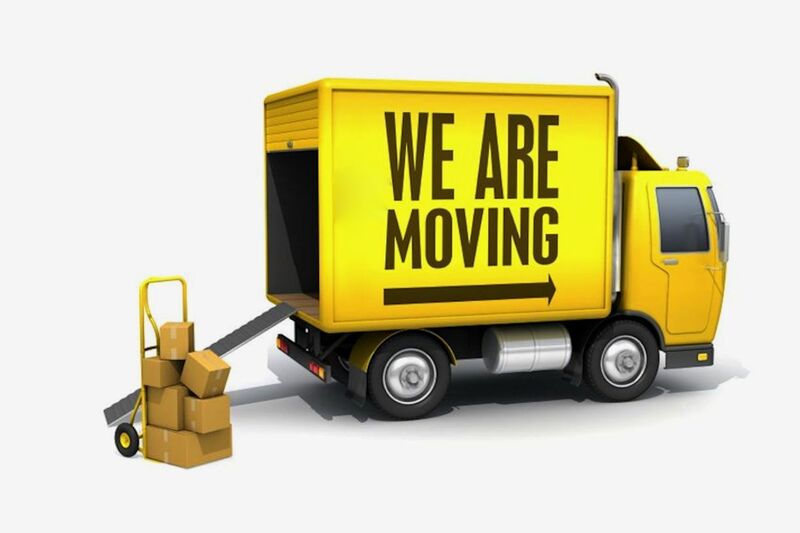 We'll give you the exact address once you're on the schedule to help us with the move. We're getting ready to move, but first, a de-stash is in order! Earlier this week, one of the founding members of A Little Something died. To call her a founding member doesn't really describe the role she played in helping to establish this organization. We'd like to take a few minutes to tell you about Moumina Marketi, known to most as Mama Moumina. She came to be a bit legendary in the history of A Little Something. When A Little Something was still just an idea and not yet an organization, the majority of the women who were interested were ethnic Bantu from Somalia. The Somali Bantu arrived in the U.S. with more challenges than most, but they had a solid community structure that helped them work together to navigate their resettlement and the overwhelming cultural differences they encountered upon arrival. The community was led by a council of elders, and Mama Moumina was the apex of that hierarchy. 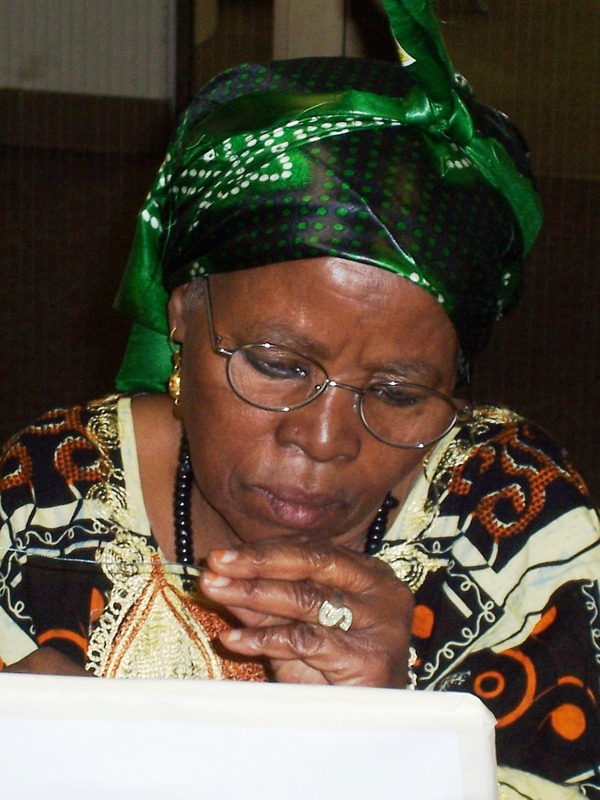 She was deeply respected and her opinions held tremendous influence in the Bantu community. It wasn't until Mama Moumina met with us and then gave her blessing deeming A Little Something to be a good idea that the Somali Bantu women felt that they could be a part of it. She encouraged all of the women in her community to at least give it a try. She knew that for these women to be able to earn their own money (that they could keep) was going to be deeply empowering and she wanted to see it happen. Mama Moumina was what many would call a character. She was a small woman with a huge personality and a commanding presence (we were all a little afraid of her, to be honest). She was wise, strict, and often very, very funny. She could silence a room with a withering stare or say just a few words and leave everyone in fits of laughter. She was a force to be reckoned with, and if it hadn't been for her endorsement of our project in those beginning days--and her willingness to lead by example by trying something new and unfamiliar herself--A Little Something probably wouldn't have gotten started. Mama Moumina had been a skilled basket weaver in Africa and wanted to continue weaving in Denver. Unable to find the traditional African materials she was familiar with, she worked with our co-founding member, Anna, to try applying her skills using unconventional materials such as plastic bags and fabric. Making jewelry did not come easily to her, but she was determined to try--and keep trying. Eventually, her husband, Shamura, followed her lead and he became the first and only male participant in A Little Something. Mama Moumina didn't care for Colorado winters, so after two years in Denver, she moved to be with relatives in Arizona. We didn't see her much after that, but others in the community let us know she was doing well and was happily enjoying the Phoenix sunshine. Today we mourn the loss of someone who deeply influenced our organization. Our thoughts are with Shamura and all of Moumina's family today. We need a tablet--can you help? 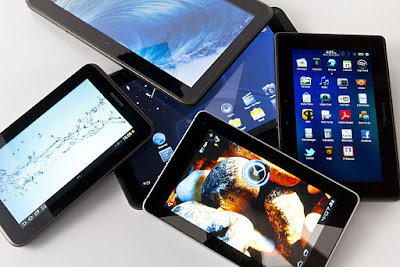 Did you recently upgrade your Samsung tablet, iPad or iPad mini? Is the one you replaced still in good working condition with a functioning battery? Looking to donate it? A Little Something needs a tablet--preferably a seven-inch size, but any size will do if it works, still has good battery life, and has a headphone jack and Bluetooth. We don't need a ton of memory. We'll use our tablet for internet access (to watch instructional videos) and, most importantly, to use our Square Point of Sale register/credit card reader when we attend events (you know, the one you sign with your finger). If you can help us out, please send an email to refugeecrafts@gmail.com. Please spread the word. Thanks! 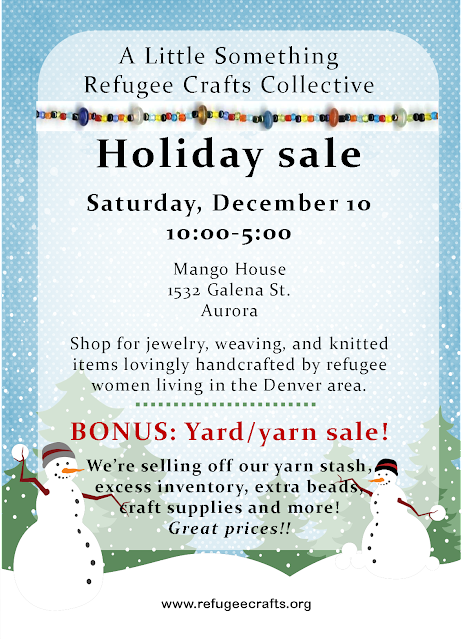 On Saturday, December 10, we're hosting a sale at our home location, Mango House in Aurora. We want to finish the year on a financial high note for our participants, and we also need to raise money for our studio rent. In addition to selling the beautiful items our participants make, we're also selling off our impressive yarn stash ($1-$5 a skein), some craft supplies, items that were donated that we can't or don't use, items that didn't pass quality control, and all kinds of stuff that's taking up room in our studio. We want to start 2017 in a space that is less cluttered and more accommodating to the makers and creators who gather there. We also need to raise money for our 2017 rent! Please come, nibble some cookies, drink some tea, and shop! We accept cash, checks, and most major credit cards. We hope to see you there! We need sales event staffing help. Seriously. Recently, we posted a call for help on Facebook. 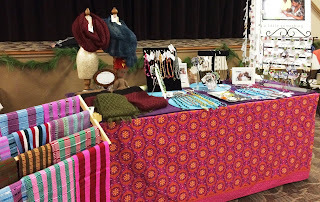 Our very busy sale season is about to launch, but we just don't have the help we need to staff the craft fair and fair-trade sales we attend. Although we had a wonderful response from people who said they'd help, in the end, no one followed through by committing to work a shift on the sales schedule. We're looking at a rather robust calendar that we won't be able to complete unless we can round up volunteers. What this means: If we have to pull out of these scheduled events, our members lose income and, frankly, we're likely to lose our studio space since we won't be able to pay the rent. If that happens, A Little Something will essentially be forced to close up shop and go out of business. This is not an exaggeration. Our annual operating expense including rent is close to $6,000, and we earn the bulk of that at the events we attend between October and mid-December. We do not have any grants or angel investors. If you live in the Denver area and you can help us out or know people who can, please ask them to read this post and get in touch with our volunteer coordinator. November events are listed below in order by date, and include location name, address and hours of operation. (December events to come soon). As previously mentioned, we will need help with set-up, table staffing and tear-down, including loading and unloading inventory. Additionally, help with transporting inventory back to our office is always appreciated. Please keep in mind that sales can be broken up into multiple shifts; if you prefer to work a full day though, of course we welcome that. Also, if you can only do a set-up or tear-down shift, but cannot work the customer service portion, we appreciate that too. These events are how the refugee women in A Little Something earn income from the beautiful items they craft. If we can't attend, our members won't see much-needed income. If you can commit to help us out, reply to refugeecrafts@gmail.com indicating your availability, and please include the sale name, date and specific day & hours you are available to work. We do our best to schedule at least 2 people at all times. Our volunteer coordinator, Uta, will send confirmations as she receives your replies and will typically follow up with final sale and staffing details about 5 days prior to a sale so you know who you will be working with. We appreciate any help you can offer!! December sales will posted soon. We have four more events coming! Again, if you can take on a sale or even just a shift, please send an email to Uta at refugeecrafts@gmail.com indicating your availability. As 2015 wraps up, we want to take a moment to sincerely thank all of the folks who have supported the women who participate in A Little Something. Whether you volunteered with us, made a financial or materials contribution, gave a product suggestion, invited us to an event, or you purchased a one-of-a-kind jewelry or fiber item, you made a tangible difference in the lives of refugees and the success of our organization. We have a lot of new and exciting plans for 2016 and we hope you'll continue to come along on our journey. We are grateful for your support! Since 2007, A Little Something: The Denver Refugee Crafts Collective has been bringing refugee women together to help them build community, learn new skills, explore the healing power of the creative, and feel empowered by their earnings. The program participants make jewelry, knit, or continue fiber arts they learned before coming to the United States. Although we have always been self-sufficient, A Little Something functions on a shoestring budget (a frayed shoestring, at that) and we need more available cash if we are to continue this work. We would like to stop fretting about our overhead expenses and focus more on creating and maintaining programs and community-building efforts for the refugee women participating in A Little Something. Since the program started, the business model has been that the women get 75 percent of the selling cost of their items, with 25 percent going back to the business to offset expenses. For the past few years, the task of trying to sell our program participants’ creations has become an increasing logistical burden. All of us who oversee the project are volunteers who have full-time jobs elsewhere, leaving little time to work craft sales and festivals in addition to doing everything else we need to so the program can thrive. There can be a delay, sometimes of many months, from when a participant hands in finished work to when she gets paid because items must sell before the women can be paid. We’d like to change that so our participants have more immediate access to their earnings. 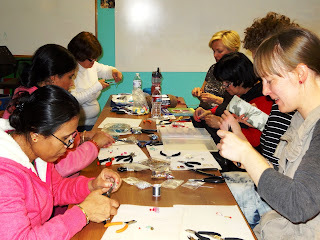 About 18 months ago, we rented a studio and office space in the neighborhood where many of the women live so that we could do more with them and grow our program. It was a good business decision, but an expensive one, given how little income we have. Although our supplies are well stocked at this time, we need to raise much needed cash. First, we want to have enough cash in the bank to cover our overhead expenses for one year so we can once again focus our attention on the refugee women in the program instead of scrambling to pay our bills. Second, we want to change our business model so the participants don’t have to wait so long to be paid for their work. To do this, we need to buy—outright—all of our inventory currently on hand, pay the artists now for that merchandise, and going forward, pay them immediately when their work is turned in for sale. This will also give us more flexibility in pricing and eventually wholesaling our inventory. Third, we would like to hire some professional help so that our financial and business records are in order and A Little Something can run more efficiently and professionally. To accomplish these goals, we need help from our friends, followers, and supporters. We hope you will support our campaign so that A Little Something can continue to grow and thrive. Please visit our fundraising site, https://www.crowdrise.com/alittlefundraiser/fundraiser/alittlesomething or use the PayPal link in the right column or at the top of this page to make your donation today. We will send you a tax receipt before 2015 comes to a close. 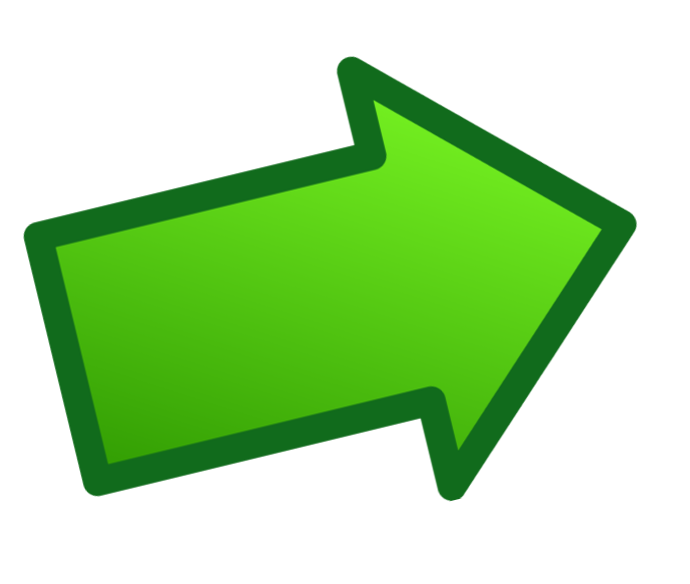 If you run into technical glitches on the CrowdRise site, you can also donate easily via PayPal using the links at the top of this page, or donate by check. To find out more about A Little Something, view our calendar, get our contact information, or learn about how you can donate or volunteer, please visit www.refugeecrafts.org. We will continue to update this blog as time allows, but the website is more current. You can still make a 2014 tax-deductible donation! Just click on the PayPal "DONATE" button above or over at the column to the right of this post. We'll send out a receipt later this week. Your donations help us pay rent at our studio space, buy supplies, and pay event fees. A Little Something board member and Realtor, Olivia Kunevicius, is offering a special gift to our organization. For those of you wondering how you can offer financial support to A Little Something in 2015, you can help us by referring your friends and family to Olivia for real estate services. Olivia will donate 5% of her commission upon a successful closing back to A Little Something. 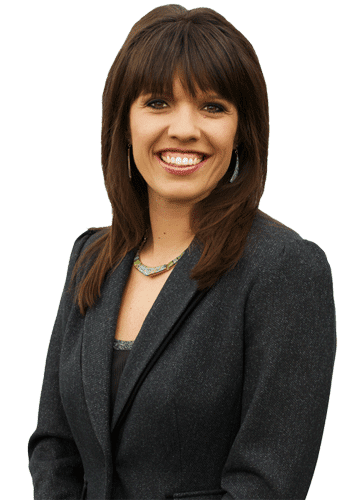 Olivia works with both buyers and sellers throughout the Denver Metro area and has been awarded 5280 Magazine’s Five Star Real Estate Professional Award for the past three years in a row. This is a very generous proposal Olivia is making on behalf of A Little Something. If you're entering the real estate market as a buyer or seller, please keep Olivia and our organization in mind. We have rent to pay and overhead expenses that aren't covered by the small percentage of sales that goes toward our operating budget. Please consider hiring Olivia as your agent if you're buying or selling property in the Denver area. Thanks! It's a sale at our studio! We still have a few sales coming up between now and Christmas. In fact, we could REALLY use some help on December 6 and 7 at Montview Blvd. Presbyterian. Anyone? Anyone?? 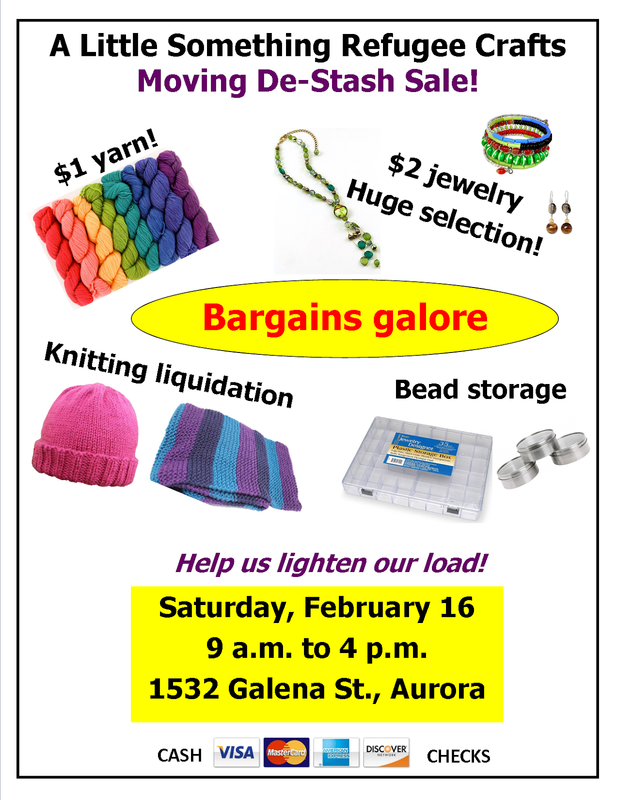 If you'd like to help us at a sale, please email Uta at refugeecrafts@gmail.com. To see where we'll be next, check the calendar on our website. Just click on an event to get all of the details. Are you looking for our website? This is not it! This is our somewhat neglected blog (we're here sometimes making updates). We have a lot of sales coming up between now and Christmas. We need some help. Right now, we have lots of sales but not enough volunteers. You need a car. You need to be able to set up an attractive display. You need to be able to chat with folks about what we do and why we do it. You need to be able to use a calculator and write up sales. Mostly, though, you need to be good with people, detail oriented, responsible and reliable. 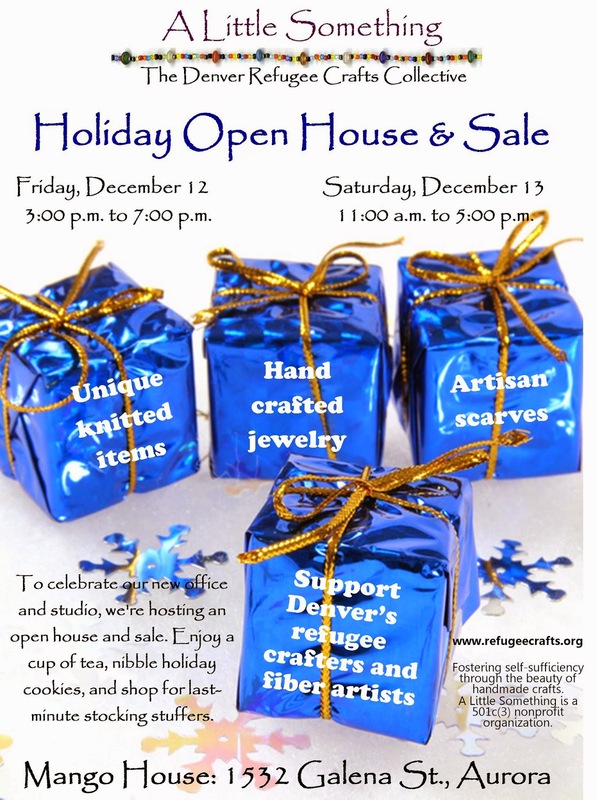 If you live in the Denver area and you'd like to help us, please contact us at refugeecrafts@gmail.com. Donations can be sent to PO Box 102077, Denver, CO 80250. If you need a tax receipt, you need to send your gift card with a donation form, which you can find at the bottom of this page. A Little Something is on the move! We're moving! This is a really big deal because it means we're growing and we've outgrown our current space. We're moving about five miles east down Colfax to 1532 Galena Street, otherwise known as Mango House. We'll be in Suite 200, four small rooms that we hope to use to their fullest potential. We'll have a small retail display, more regular meetings with our members, a real crafting space, a real office space, and more. The big move takes place on Sunday, June 22, and we need help. Many hands make light work. If you can help us move our beads, yarn, and shelves, please contact Uta at refugeecrafts@gmail.com. Seriously. Can you help? As part of Colorado Gives Day, we'll be selling our wares at Emily's Coffee, a refugee job training enterprise at Emily Griffith Technical College. If you're downtown, stop by and shop! We'd just like to remind you that our sales calendar can be accessed through our website, www.refugeecrafts.org. In addition to our usual pre-holiday sales, we'll be hosting a clearance sale at our office. Friday, December 13, 3-7 p.m.
Saturday, December 14, 11 a.m. to 3 p.m.
Stop by, say hello, meet members of our board and possibly some of our crafters. This will be a great opportunity to pick up some stocking stuffers and inexpensive gifts. We'll have a lot of inventory marked down and priced to sell! We hope to see you there (or at any of our other sales). Click on the image above to go to our Website. Want to know where to buy our merchandise? Check our calendar for a list of upcoming sales throughout the year! Click on the picture above for more information. 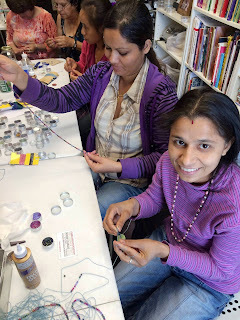 We meet with our member artisans every Wednesday from 10-5 and on the third Saturday of the month at Mango House in Aurora. If you would like to help out at these meetings or at a sale event, please contact us at refugeecrafts@gmail.com. Huge thanks to everyone who has sent us supplies. Your kindness and generosity keep our program going. If you have supplies to donate, click on the rainbow for more information. 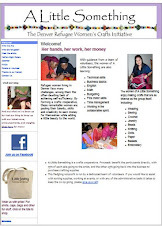 Find our Facebook page at A Little Something (The Denver Refugee Women's Craft Initiative) and become a fan today! We love to know who visits! Please sign our guestbook! Please feel free to leave us a comment, but don't forget to copy the little code at the bottom of your entry before you post! 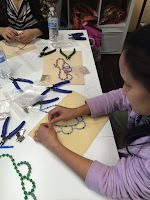 The adventures of a group of ESL teachers, volunteers and refugee women who are sharing the path to self-sufficiency through jewelry making, weaving, needlework, and other crafts yet to be conquered. Eventually, we'll be a real business working on a self-sustaining, co-op model. We believe that the combination of creativity and community foster healing, empowerment, and personal discovery--not to mention a sense of pride and accomplishment! In time, we hope to include crochet, embroidery, crewel, tie-dye, and embellished scarves to our craft project. The items made by our group will be sold, and the profits will go directly to the women who make the jewelry. The goal of the program is to help the refugee women acquire skills, confidence, and tangible rewards from their craft work. The project grew out of another project that was a spin-off of the Colorado Refugee ESL In-Home Tutoring Program, which is managed by Sharon McCreary, Volunteer Coordinator. The spin-off projects are the result of sheer genius on the part of some of the most creative, resourceful, and dedicated volunteers on the planet! A refugee is a person who has had to flee his or her country of origin due to a well-founded fear of persecution due to war, race, religion, ethnicity, nationality, political opinion, or association with a particular group. The United Nations must formally identify a displacement situation and declare it is legitimate in order for the population involved to be given refugee status. Ideally, refugees would be able to return home after conflict passes, but in most cases, this day never materializes. When the United Nations determines there is no reasonable expectation that repatriation is possible, refugees are resettled elsewhere. Currently, there are more than 32.8 million asylum seekers, refugees, and internally displaced persons of concern to the UNHCR (the UN's refugee agency). Of these 33 million, 50,000 refugees are resettled in the United States annually--more than in all other resettlement sites combined. In addition to the USA, 15 other UN member nations accept refugees for resettlement, including Australia, Canada, Denmark, Finland, Ireland, New Zealand, the Netherlands, Norway, Sweden, and the United Kingdom. Other countries may consider resettlement petitions on a case by case basis, normally because of family reunion or strong cultural links. Escaping conflict is just the first step in starting over; refugees face immense challenges throughout the resettlement process as they attempt to negiotiate a new language, new culture, and often harsh economic realities. In the US, refugees are expected to achieve 100% self-sufficiency within 4-to-8 months after arrival in this country. Could you do it? UNHCR: The United Nations' Refugee Website. Everything you ever wanted to know about refugees and their situation worldwide. This blog is lovingly maintained by the all-volunteer A Little Something coordinating team.